Tungareshwar is a sanctuary that I’ve talked about in brief in my very first post, and also as the very last escape for many animals in Revisiting Nagla Block, that mainly focused on Nagla Block being a corridor joining Sanjay Gandhi National Park with Tungareshwar Wildlife Sanctuary. And if SGNP is the lung of Mumbai, Nagla Block is the heart, and TWS is the last leg – one that does not lead any further, except into villages and vast fields of rice and other crops. The north of TWS is devoid of any forestlands for miles save for small pockets, until we reach a few remaining havens at the very tip of the Western Ghats – just near the shoulder of Gujarat. The Tungar Hills where this sanctuary was established are still well preserved, but in recent years Tungareshwar has changed drastically. It is not just the little village on the outskirts that has seen a high influx of migration, but so has the sanctuary. And the sanctuary is no more a haven for wildlife, but a backyard to go and dump your wastes into the forests. The only river that flows through the hills, the Tungareshwar River, is now severely polluted. Activities like washing bikes and trucks; disposal of wastes and domestic garbage; and deforestation by encroachment are the building edifices for the fall of Tungareshwar as a wildlife haven. When we reached the gate, there were songs being played out loud – to whose ears I know not – but certainly not God, nor the nature. It was more of an advertisement – perhaps of the fact that they obtain electricity only to waste it in such a way. In the front of this temple, on the left of the gate is a small Forest Department chowki. This small structure is abandoned and left to rot – a reason (and the only) for the activities going on inside the Protected Area, that are not permitted under the law. We entered the sanctuary with much disappointment, but we did expect a large number of people here to visit the Tungareshwar Temple that is halfway up from the entrance. The people there weren’t the pilgrims however – they made only a fraction of the people who had come for their morning rituals, such as attending nature’s call. This subject is a hot debate, considering the economic situation of the place, as well as the utter ignorance of the Municipal bodies that are supposed to govern, and not to mention provide basic sanitation provisions to the people. Road widening in forests leads to erosion! This is the road – nearly a two lane highway that runs the length of the temple and beyond – to an ashram. Of all the issues Tungareshwar is currently dealing with, the biggest probably is ignorance. And only by creating awareness through education in this region, and by making the rules more stringent than before, can it be saved. It is still not too late for TWS to be sprawling again with animals and plants, but we might have missed the first SOS from nature, and that is of soil erosion – about which I’ll talk a little later. And so we began with concern, but the sightings were worth cherishing, for Tungareshwar still harbours an amazing diversity. We saw a large lady Nephila trying to rebuild her destroyed orb-web with her golden silken threads shining in the sun – a reason why they are also called Golden-orb-weavers. While coming back from the walk, all we saw were two legs dangling by a line, separated by a large hole in her abode. This dragonfly is fond of forest streams – especially those with a thick cover as well as emergent boulders to bask upon. His nymph stage he spent in this stream water, and now he’s out and about claiming his territory over the waters. It was sad to see that there were more banana peels here than dragonflies. The Queens shed their wings after the nuptial flight. This they do to be able to inspect a place to nest – and this ant was doing just that. She had found a perfect little plant with broad leaves that could be woven into a nest, soon after her first batch of daughters, that is worker ants, have taken birth. This caterpillar is yet unidentified, but this picture shows more than just its head. The white spots scattered on the caterpillar are most likely eggs of some parasitic insect. This is the season of caterpillars, so finding one is easy, but getting to their true identification is difficult – mostly because they are either least studied, or simply because there just isn’t much information about them on the internet. This is the sad state of the knowledge of biodiversity in India, but it’s not null. This caterpillar especially holds a mango tree very close to it – and unfortunately, she was on her way up to the tree, but she wouldn’t have found any leaves around, for the tree was dead. We carried her then to the next tree, and dropped her on her way up the trunk – this was her destiny now, and I hope the adult Common Baron that will emerge will be grateful to pose for a photograph! There are two forms existing in the northern Western Ghats – Clytia and Dissimilis. Both forms are not-so-uncommon, but can be easily mistaken for a Danaine butterfly. The Clytia form mimics a Common Indian Crow (Euploea core) and the Dissimilis form mimics a Blue Tiger (Tirumala septentrionis). This is the Indian Violin Mantis, probably Gongylus gongylodes, a superbly camouflaged mantis of the Indian subcontinent. This mantis is rather common in the region but not easily seen. Our friend here was a nymph, with gradually developing wing buds seen just near the girdle. Update 28 Oct 2012: It has been identified as C. providenceae (see comments) by Evgeny Shcherbakov (thank you!). A detailed research paper of this newly discovered species described by Vyjayandi, Rajeesh, Sajin John, Dhanasree and Ehrmann (2009) can be read here. If it is indeed this species, I'm glad to say that it is fairly common (have documented it twice so far) in the Sahyadri. Seeing four different types of mantises in a day was a great relief. It is what halted me from going about my rant against the activities in Tungareshwar. Seeing predatory insects was an indicator that the prey population is abundant. But it is important to evaluate the impacts of encroachment that pose a direct threat to this diversity. This dance is their own unique way of saying I’m here, watch out! and they’re well dressed to perform it – with their feet clad in white socks, and their red striped legs contrasting their silvery attire. This one was a female, and her abdomen is full of eggs which she will lay in the soil. Another fly was seen near a wide clearing with small shops. This Black Soldierfly, Hermetia illucens, is a widespread fly in the family Stratiomyidae. I was rather surprised to have not come across a single individual for so many years. This fly has a great job, and its larvae are employed my mankind in manure management (especially in North America). Its use in India has been limited, but it does its job faithfully in its wild environment. It is a male Euchariomyia dives – a little, delicate fly in the family Bombyliidae. This fellow Katydid is not dead, which is what I thought at first, but she is actually just laying flat on the leaf to absorb as much of the suns energy as possible, simply by increasing the surface area facing the sun. It is entertaining to observe these animals bask in their own unique poses. Jim at North-West Dragonflier covered an excellent article on how dragonflies bask in the sun. This beetle is commonly called a Giraffe Weevil (it is not the same as the Madagascar’s Giraffe Weevil, although they’re similar). They fall into the category of leaf-rolling weevils. The leaf is rolled around the eggs, and the grubs feed on the leaves from within (source). The females (pictured here) possess stout necks. This Jumping Spider is Brettus sp., a really beautiful Jumper in the family Salticidae. This fellow was a male, and the female that was a few meters from him was reluctant to pose, several other Jumpers were seen, including Phintella sp. The Spitting Spiders (Scytodes sp.) are still seen around the paths, but their numbers are gradually declining – as is expected. They will soon cease to exist by the beginning to winter, and miraculously take life at the beginning of the next monsoon. And all of them that we saw were hatchlings a few days or weeks old. Their basking places were almost always under a meter from the ground, whereas adult C. versicolour’s do go up a tree several meters high. It is perhaps because there are more insects in the undergrowth – the primary food of these lizards, than at the top. The numbers of C. versicolour has gone down in the urban areas, therefore it is good to see them flourishing here. Although we may have seen over fifty hatchlings, only a handful will survive amidst the forests that hide snakes in their boughs. She was a Bronze-back Tree Snake, one of the fastest snakes of the northern Western Ghats – and she was on her way to cross the river to the other side, or maybe to drink water – but she stopped in her way and looked back, then slithered back to the shades of the riverbank at my advances. The villagers also showed us a large Checkered Keelback that was swimming in the river. This large lizard sat boldly basking on a bag of soil as we clicked pictures. She was probably in bliss of the plenty sunlight, and oblivious to our proximity. This was rather surprising, because Skinks are very shy of people. I also happened to notice that this skink has very human-like digits on its forelimbs! Soil erosion can wipe out mountains! A large side of the road had given away – eroded by the torrential rain that lashes for four months. Since there were no trees to hold onto the loose earth, the ambition of creating an access to the ashram is only going to incur in loss of land and the biodiversity. It will be worth visiting this area next year to assess the real loss due to erosion. In the meantime, what they could do is take a break from dumping more rocks and plant some trees around their roads. We turned back from there and returned to our homes. The visit to Tungareshwar was an eye-opener, of how we are putting pressure on the environment without realizing it. The populations migrating inside a Protected Area cannot be blamed directly, for they are driven by the basic needs, but population explosion is the stark reality of our times. In case of Tungareshwar, it will be worthwhile to educate the visitors by establishing an Environmental Education Centre, as well as by putting up displays at the entrance and on the highways inside the sanctuary regarding its biodiversity and the threats posed by mankind – so that, at least one in ten will stop and think and put his plastic bag in his pockets and not in the forests. And so we come to the end of Monsoon, and the beginning of the post-monsoon months. I am keen on putting all this together into one document and publish it by the end of the year so that it acts as a documentary of sightings and observations. I will be leaving now, and will return next month. Farewell! second time on your Blog, and again:very interesting! Beautiful Wilflife santuary and amazing pictures of insects and reptiles! I loved your post. Found it very interesting, and the photography was excellent. Hello The Writer! Thank you for your kind words! 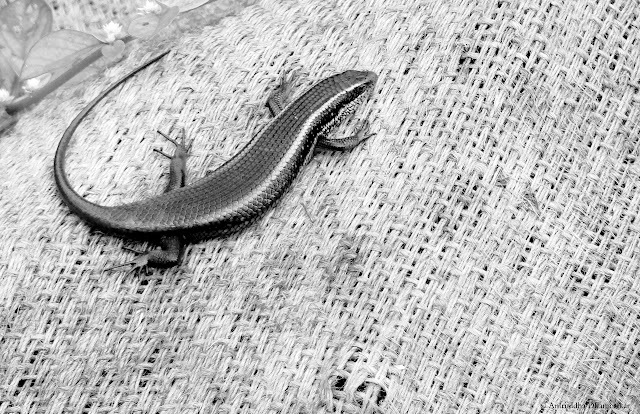 :) It certainly can be the Many-keeled Grass skink, also called Brahminy Skink, if it was large. They are rather common in urban areas. your blog is a total labor of love. keep up the good work. pleasure reading the articles. Hi, nice photos! The second mantid is Cotigaonopsis providenceae, and it's a full-grown adult, just short-winged. The first photo of this species in nature, I guess. Thank you Evgeny! I always considered it a rule for mantises with short wings to be nymphs. This one is fairly common in the Western Ghats. Nice write up Aniruddha. I am planning to visit Tungareshwar in the next couple of weeks with a few friends. Hope our trip is as interesting. nice article !!! especially the photographs are very good !! Hi, Is this like a trek along the trail to the temple or you can wander around nearby going a bit out of the way? I mean is there any fear of leopards or other animals? Hi Kalpesh, the trek is not too long neither too tiring. The road is quite large for a bus to pass through, and out-of-the-way paths are not known to me. It should be safe from wild animals during day time, but I would recommend going in a large group. Fabulous pictures and a well documented trip! I went to TWS just before the previous monsoon to avoid the crowds. Litterbugs do mess up the place but it was a good trail. Very informative. Thanks for taking the effort and freely sharing your knowledge and expertise. Hope the authorities take cognisance of the degradation - and prevent further damage. Beautiful photographs and very nice article. Is it safe for a young married couple to visit on their own? Since there is a temple at the top there is a large influx of people during weekends, but I always recommend going in a group. Can you quickly tell me how to reach from Kalyan? You will have to take SH 79 and look for Tungarfata which leads to Tungareshwar temple. Can anyone give me a list of flora and fauna found in Tungareshwar Sanctuary? It is very sad! Every naturalist who has been to Tungareshwar has foretold of this degradation. Unfortunately, very little attention is given to conserve the Tungar hills which shares a unique habitat between konkan and western ghats region. There are some legal actions being taken, but they're very slow.